The named after the town of the same name Appellation with 364 hectares of vineyards is located in Burgundian Area Côte d'Or (Côte de Beaune). Small areas in the community Blagny also count. The town is also known as the "capital of Burgundian white wines". In Meursault the Cistercian the Duke of Burgundy on Christmas Day of their founding year 1098 their first vineyard as a gift. Every year on the third day of the "Trois Glorieuses", the "Paulée de Meursault" takes place in Meursault, which goes back to the tradition of a jointly harvested meal after the harvest (see also under Hospices de Beaune and Confrérie des Chevaliers du Tastevin ). There are mostly white wines Chardonnay and Pinot Blanc which are among the best Burgunds and are mostly matured in oak barrels. A winged word in the parish word reads, "Only those who drink Meursault never become drunkards . " The red wines are going out Pinot Noir with smaller shares of Pinot Liébault and Pinot Gris vinified. There are no classified Grands Crus in this area. 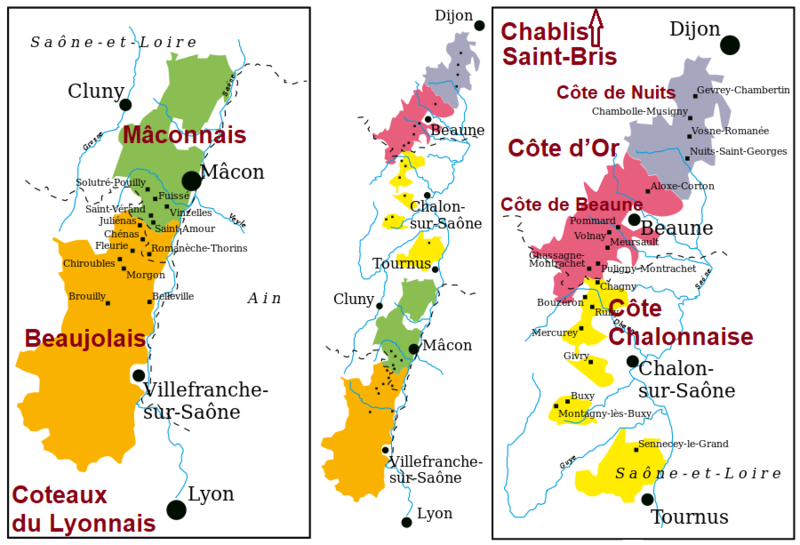 The most important of the numerous Premiers Crus with 160 hectares of vines are Bouchères, Charmes, Genevrières, Goutte d'Or, Poruzot, Perrières (Grand Cru-worthy), Pièce sous le Bois, Poruzots, Santenots and Sous le Dos d'Ane.